AstralPool Trichloroisocyanuric Acid Powder TCCA 90% 10kg. Chlorine Disinfectants & Non Comburent, slow-dissolving organic compound, stabilized, for the treatment of pool water with 90% available chlorine. Initial Treatment: Add 10 grs. of product for m3 of water. Wait for two hours before adjusting the pH level between 7,2 – 7,6 using either Solid pH Reducer or Solid pH Enhancer. Maintenance Treatment: Once the pH level of the water has been adjusted, add 1 or 2 grams of product for m3 of water daily. This dose is merely meant as a guideline and may be modified according to differing characteristics of the pool or climate. The Initial treatment (Super chlorination) should be repeated whenever the water does not appear transparent. Introduce the necessary dose of product inside the skimmers and then turn on the filter equipment; in this way the product will dissolve when it begins to move through the skimmers. It is also possible to pour the dose of product equally over the surface of the swimming pool, preferably during the evening and when are no swimmers in the pool. 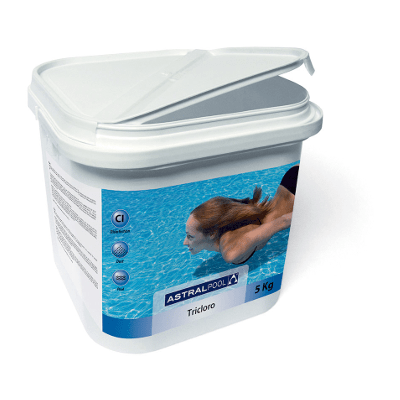 The level of free residual chlorine should be between 0,5 – 2 mg/l. This level is easily determined using a chlorine and pH test kit, and should be measured at least twice daily.